The new system will repair crumbling walking infrastructure neighborhood by neighborhood. Denver City Council is setting up a fund to help residents pay for repairs to sidewalks abutting their properties. The infusion of public support for sidewalk repair should lead to better walking conditions in the city’s poorer neighborhoods, where property owners struggle to maintain sidewalks themselves. 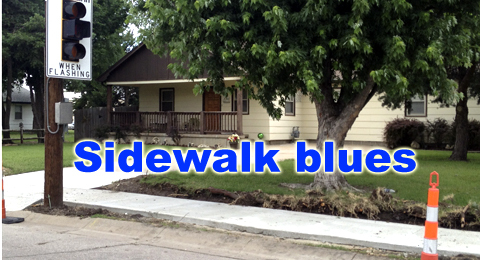 Local law lays responsibility for public sidewalks at the feet of private homeowners. The result is an uneven pedestrian environment, literally and figuratively: Denver’s wealthy neighborhoods often boast gleaming, flat, even heated sidewalks, while people in the city’s less affluent areas contend with rough paths jutting this way and that. The City Council Finance and Government Committee voted unanimously to create the sidewalk fund Tuesday with an initial infusion of $4 million for year one. DPW is still ironing out details, but here’s what we know: The city will foot the entire bill for Denver’s poorest households and assist better-off residents on a sliding scale. Some Denverites may only qualify for an “extended repayment” plan that gives homeowners three years to pay back the city after the work is done. They’ll have to pay 1 percent annual interest, which will go back into the city’s sidewalk fund to pay for other people’s repairs and the cost of inspections. The $4 million will get the program started next year, according to the Denver Department of Finance. The fund will grow over time with interest payments and annual general fund transfers. DPW will administer the program in phases, choosing specific geographic zones where sidewalk conditions will then be inspected block-by-block, to see where repairs are needed. The department will prioritize areas where people walk and use transit often, but will not have a final list of places in line for inspection and repair until December 12. Mayor Michael Hancock created three new positions to manage the program, which will also step up enforcement of property owners who can afford sidewalk repairs without help but let conditions deteriorate. The new sidewalk fund is a positive step, but it won’t solve all of the city’s sidewalk problems. It won’t pay for any new sidewalks or expansions of sidewalks that are too narrow — just repairs to sidewalks that are falling apart. “This is certainly an epic and important piece of the puzzle, but it leaves an enormous amount left on the table to deal with on the topic of sidewalks,” Kashmann said. Just wanted to remind everyone that sidewalks are part of the legal, public right-of-way, just as roads and streets are. The sidewalk in front of your house is not your private property. Requiring you as a private citizen to maintain it is as bizarre as requiring you to fill the potholes or shovel out the snow in the street in front of your house. People in cars are entitled to rights-of-ways cleared & maintained at public expense. People on foot are not. This is an equal protection issue. I never understood that myself. By requiring private residents to both maintain and shovel sidewalks cities have created a situation where some areas have flat, well-shoveled sidewalks while others are uneven and/or often not shoveled. It depends upon the whims of the property owner. Repairing and clearing sidewalks should be a municipal responsibility, not a private one. In fact, this is why there is often resistance to adding sidewalks in some suburban areas. The residents are often OK with the idea of adding a sidewalk, but don’t want to be responsible for shoveling it, or repairing it. Well, it’s a tiny tiny step in the right direction. However, it’s completely idiotic that they don’t simply fund sidewalks the way they fund roads — out of general property taxes. Sidewalks are a part of the road. A vital part. If u every try to walk on Sheridan Blvd east denver side from 7th to 8th. It has the most sorry donkeyed bus stop as well. The ground is corrugated.